Homeowners and business swear by on the great qualities of having epoxy flooring for their properties. So what is epoxy flooring and why has it gained popularity in Dallas and its surrounding areas? When we walk inside a hospital building, we are mesmerized when we see the floor of glistening and we wonder, “What did they put on this floor?” And doesn’t it feel nice to park your car in a polished garage floor without having to polish it all the time? The secret? epoxy floor coating systems. Yes, that is its effect to any concrete floors. Epoxy, by definition, means an adhesive, paint, plastic or other substance made from a brand of synthetic thermosetting polymers consisting of epoxide groups. Based on the combination of resins and hardeners, epoxy systems are solid plastic materials. The end result is strong, highly durable, and chemical and weather resistant. They are so reliable and sturdy that they are mostly used for commercial, residential and industrial floorings. Concrete floors applied with epoxy floor coatings are smooth and can last for many years or withstand any heavy weight. Sure epoxy flooring is tough and could stand the test of time, but like all types of flooring it also has its advantages. However, epoxy floors have more benefits than drawbacks. AppearanceConcrete floors with epoxy flooring are glossy and radiant compared to an average floor. Their look makes it really appealing to the eyes. Its soft and smooth surface makes it low-maintenance. Cleaning up is very easy as nothing sticks much to this type of flooring. Cost-efficientAs for the market value, the per foot value of epoxy floor coatings are affordable. Pricing for epoxy floor still remains as one of its biggest and most competitive benefits. Installation costs are lower since it can be installed directly over concrete floors by the best concrete contractors in town. High ResistanceEpoxy floor can resist anything – oil, bleach, gas, chemicals, transmission fluids, cleansers and many more. Frequently used in garages and industrial properties, epoxy floors are also heat and water resistant. Another advantage of epoxy flooring is that is that these floors are also impervious to germs. Sanitizing these floors are easy and one of the reasons why it is highly recommended for use in hospitals and clinics. Durability and LongevityValued for their durability, epoxy floors have longer lifespan than any other types of floorings. Concrete may be its biggest competitor but it needs to be properly secured and maintained. Epoxy floorings are coated on top of concrete, so it makes for polished concrete, which is remarkably more durable. When installed properly, epoxy floors can last for several decades without cracking or peeling. Protective FeatureEpoxy floor coatings protect the concrete beneath it from moisture, grease, stains and cracks. In the long run you save a great amount of money and effort on cleaning and maintenance costs. VarietyEpoxy floors are widely available in different colors that create a flawless and elegant shine. There are also personalized and traditional patterns to choose from. 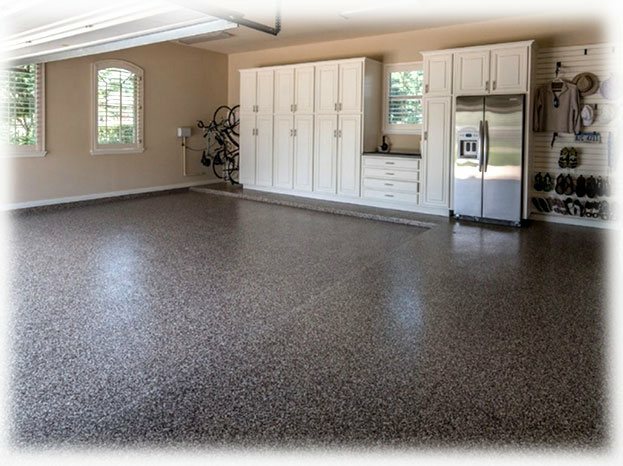 SafetyHaving your garage floor coated with epoxy enhances visibility by reflecting the light off the floor, thus ensuring safety when you park your car. TemporaryWell, as we all know everything in this world is never constant. Over time, everyday wear and tear can also take its toll on your floor. Eventually, you will have to add another coating of epoxy to keep it looking nice. SlipperyOil covered epoxy can be slippery. And oftentimes when it is wet, it can be very dangerous. That’s why epoxy flooring is not recommended in areas that are prone to spills or water. PreparationAn extensive amount of effort is needed to properly install epoxy floor coatings. The concrete has to be checked tediously to ensure that there are no cracks, and it is free and clean of any grease, oil or solvents before applying the epoxy. Other setbacks of epoxy floor coatings include its time-consuming application, strong smell, and costly removal process. And application, when done by an amateur, can end in a catastrophe. Despite all these disadvantages, epoxy flooring is still the most preferred choice of flooring for homeowners and business owners. Dallas Epoxy Pros is your ideal company to provide you with the high-quality epoxy flooring. You can trust in the excellent output our expert specialists will provide for you.